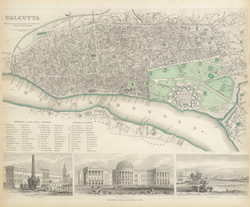 Engraved map with pictorial inserts of Calcutta in West Bengal by an unknown engraver published in 1842 under the superintendence of the Society for the Diffusion of Useful Knowledge. Calcutta was founded by Job Charnock in 1690. Thanks to its position on the River Hooghly, a tributary of the Ganges, Calcutta soon became the largest port in the region. The city was also known as 'The City of Palaces', due to the impressive array of public buildings along Esplanade Row and Chowringhee Road. The three pictorial inserts along the bottom edge of the map show Writers' Buildings, Government House and Esplanade Row. The Writer's Building is located on the north side of Tank Square, later Dalhousie Square and now BBD Bagh. It was built as the headquarters of the East India Company by Thomas Lyon in 1777. In front of the building is the monument erected by John Zephaniah Holwell to the memory of the survivors of the 'Black Hole' of 1756. Marquess Wellesley commissioned the building of the new Government House on his appointment to Governor-General in 1798. The architect, Captain Charles Wyatt of the Engineers, based his designs for the building on Kedleston Hall in Derbyshire. This view shows the southern façade. There is a circular colonnade with a dome in the centre and two projecting wings either side. Esplanade Row runs east-west to the north of the Maidan, the open space in which the new Fort William was built in 1757. By the close of the eighteenth century, Esplanade Row was the location of numerous public buildings. The new Government House is shown on the right.